Hello and Welcome to CC’s Painting website!!! We are a small local painting company that prides itself on providing high quality service. We service Waukesha county, the Lake Country area and it’s fine suburbs. We have been servicing these areas since 1990. We personally will take a look at every job to ensure that each estimate is fine tuned for the jobs specific needs and to make sure we are providing the most cost effective solution. 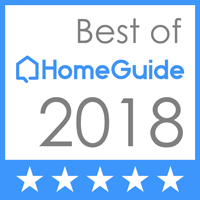 We are proud to be considered the “Best of HomeGuide 2018”! Your job measurements are not run through a computer program to determine what it will cost nor will you have some part-time seasonal employee show up at your door. We are a local company that only works in a limited area to ensure that our service is beyond your expectations and our employees are only full time, year round, experienced painters. Our goal is to make you feel comfortable with every detail of your job in a manner you can understand and ensure there are no hidden surprises at the end of the job. In other words you will know where every dollar of your hard earned money is being spent! We proudly use and recommend Sherwin-Williams products. You can view the Sherwin-Williams ColorSnap paint color assistant to help you with your color and paint choices. Please feel free to contact us for your free estimate thru our Contact Us page. CC’s Painting provides quality and professional painting services.